When I think violence in medieval French poetry, I think Chanson de Roland. After all, who can forget Roland impaling Aëlroth with his lance, hoisting him high up in the air, and then tossing the freshly dead foe a good spear’s length away? There are other medieval French tales with violence. There are violent deaths in Marie de France. For example, in her lai Equitan, two adulterers are boiled to death in baths of scalding water. Though the violence is gruesome, it is described in the way violence appears in fables or fairy tales and folk tales: direct and to the point. The poet or storyteller simply says, “They were burned alive in a bath of boiling water.” The descriptions typically lack the relish and gruesome detail found in other works of medieval poetry like Chanson de Roland. If someone were burned alive in a bath of boiling water in Chanson de Roland, the poet would likely go on about the burns, mingling their shrieks of pain with steam silently rising from the water. Now, you also have violence in the French versions of Arthurian tales like the Arthurian Romances and Perceval by Chrétien de Troyes and the anonymous Mort de Roi Artu, but I’d previously found that the violence in these texts was reserved for tournaments and single-person combat scenes. The scenes can get quite bloody, but the wounds suffered are typically the type to heal after a poultice and a day or two of sitting out the hunt. In other words, justice is not usually served in these tales with a violent death. It’s more likely the offender would be sent to personally apologize to Queen Guinevere and then spend the rest of his life in her service as punishment for his rude behavior to women or something like that. But after seeing his description of Erec in a rotten mood being ambushed by three robbers in the woods a few days ago, I realized I had been wrong about the 12th century poet Chrétien de Troyes. He deserves his own installment of Today’s Medieval Bloodfest. This one comes from Erec et Enide the first of his Arthurian Romances. Erec is King Arthur’s second favorite knight. He’s probably Arthur’s real first favorite knight, but we know what a fragile ego Gawain has in the French books. Gawain’s a pretty good guy in the English books, but in the French he can be a bit of a jerk. If I was one of the Knights of Round Table knowing I only got the job because I’m the king’s nephew I guess wouldn’t be a very secure fellow in the company of self-made heroes either. Anyway, back to Erec – he accompanies Queen Guinevere and her maiden on the hunt for the White Stag. Stuff happens and Erec is forced to separate from Guinievere and go on a quest. During this quest he defeats a rude knight in single-combat and sends him back to Queen Guinevere for further punishment for his wretched offense. Erec meets a maiden named Enide, he gives her the honor to hold a hawk that only the most beautiful woman in the land can do and then brings her back to King Arthur’s court where an even greater honor is bestowed upon her – publicly receiving a kiss from King Arthur – a ceremony associated with the White Stag hunt. Erec marries Enide and they live happily ever after. Well, almost. Before Erec met Enide he was one of the greatest knights around, but since meeting Enide he’s stopped competing with other knights and instead spends all of his time adoring his lovely wife. Though he still gives his fellow knights money for gear and travel expenses, he’s basically dropped out of the tournament circuit entirely. Erec doesn’t seem to mind, but it starts bothering his wife. She hears the nasty things his friends say about him behind his back, how he’s lost his reputation as a knight and everything. These were the very friends her husband was personally helping rise in the ranks! The robbers were concerned about someone thinking they had acted treacherously. Imagine that! Were they polite robbers? Still, it’s interesting how in tales of chivalry, everyone – even villains – have some regard for humanity. This is why it is difficult to find scenes in them that are violent enough for Today’s Medieval Bloodfest. There simply isn’t the complete disregard for humanity in the texts that is required for violent characters. Bad guys, once caught, are taught a lesson and then proudly reform themselves. When Erec hears him, he defies him. Both give spur and clash together, holding their lances at full extent. But he missed Erec, while Erec used him hard; for he knew well the right attack. He strikes him on the shield so fiercely that he cracks it from top to bottom. Nor is his hauberk any protection: Erec pierces and crushes it in the middle of his breast, and thrusts a foot and a half of his lance into his body. When he drew back, he pulled out the shaft. And the other fell to earth. He must needs die, for the blade had drunk his life’s blood. Qui bien le sot droit envahir. Pié et demi dedenz le cors. Car li glaives ou cors li but. Quand Erec l’entend, it le défie. tenant les lances à l’horizontale. car il a bien su adjuster son coup. qu’il le fend de haut en bas. d’un pied et demi dand le corps. car la pointe de la lance lui but le sang du coeur. Then one of the other two rushes forward, leaving his companion behind, and spurs toward Erec, threatening him. Erec firmly grasps his shield, and attacks him with a stout heart. The other holds his shield before his breast. Then they strike upon the emblazoned shields. 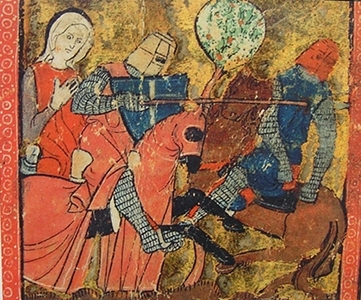 The knight’s lance flies into two bits, while Erec drives a quarter of his lance’s length through the other’s breast. He will give him no more trouble. Erec unhorses and leaves him in a faint, while he spurs at an angle toward the third robber. When the latter saw him coming on he began to make his escape. He was afraid, and did not dare to face him; so he hastened to take refuge in the woods. But his flight is of small avail, for Erec follows him and cries aloud, “Vassal, vassal, turn about now, and prepare to defend yourself, so that I may not slay you in an act of flight. It is useless to try to escape.” But the fellow has no desire to turn about, and continues to flee with might and main. Following and overtaking him, Erec hits him squarely on his painted shield, and throws him over on the other side. To these three robbers he gives no further heed: one he has killed, another wounded, and of the third he got rid by throwing him from earth to steed. He took the horses of all three and tied them together by the bridles. In colour they were not alike: the first was white as milk, the second black and not at all bad looking, while the third was dappled all over. So it turns out Chrétien de Troyes can carry his own in poetic descriptions of gruesome violence. While Marie de France might have only used a line or two to say that Erec stabbed the robber in the heart with his lance, killing him with one blow, Chrétien uses 9 lines to describe Erec’s blow that could easily pass for a brutal passage in Chanson de Roland. Chrétien ends the violent passage by telling us that Erec’s lance drank the very blood that gave his attacker life straight from its source – his heart. Some say that he wrote an earlier Tristan but it is lost. References to Erec et Enide in Modern English translation are taken from Chrétien de Troyes: Arthurian Romances, Trans. W.W. Comfort (London, 1963). Erec et Enide in Old French and Modern French translation from Erec et Enide, ed., trans. Jean-Marie Fritz (Paris, 1992). I guess that’s the penalty for trying to steal from others – even if they are richer than you. Or, perhaps it’s what happens when you pick on a guy who is fighting with his spouse –he might not give you mercy and send you to be dealt with by the King. Instead, he might just harshly render justice right then and there – and take your horses too!